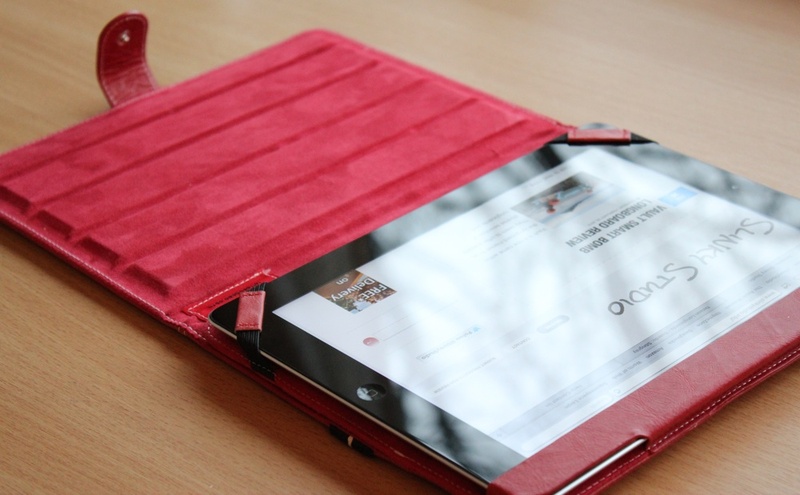 Dressing the iPad up is a hard accomplishment as the tablets organic design is very fetching. 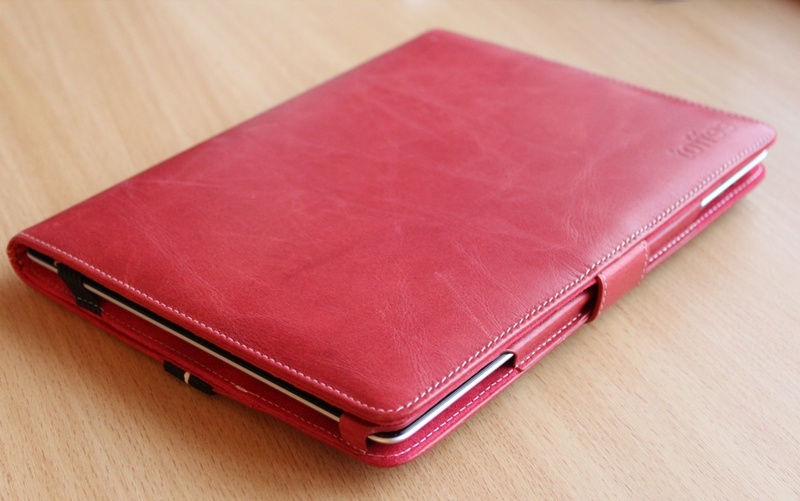 However the Toffee Folio book styled case for the iPad 2nd, 3rd and New 4th generation is a genuine luxury outfit. 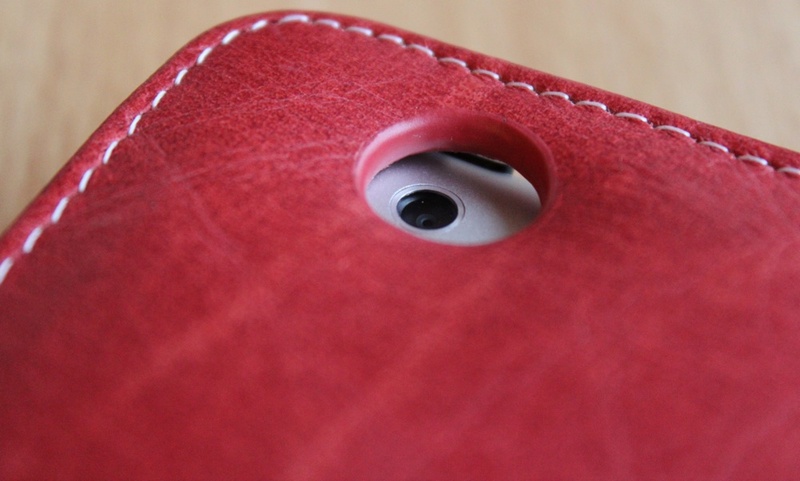 The real leather and fine detailed stitching implemented on the front and back of the case is prominent to touch and look at. 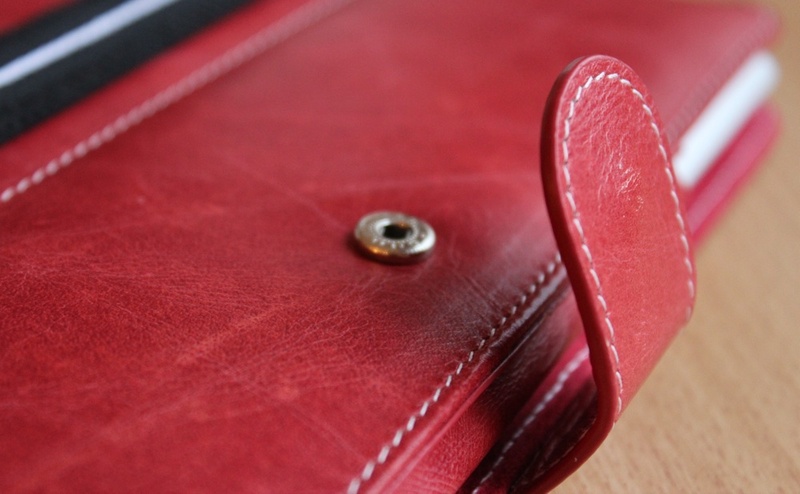 The leather is lightly textured and comes in an optional red, brown and black colour. The combination of shape, textures and colours make a sophisticated entity. We've not seen any stitching come loose or material break. However we have noticed colour fading on parts of the leather that we've made regular hand contact with. This is something that has only grown worse, which is concerning. The interior of the case presents a matching colour scheme of the front and a simplistic layout. On the right hand side is an area with two elasticated bands and a leather strap that secures the iPad into place. This method of hosting the iPad makes it somewhat easy to remove and insert but does raise a few restrictions, namely the iPads right hand bezel which is directly covered and this restricts the usability because it's so dense against the screen. General everyday usage has been great. The case does add quite a bit of weight to the iPad and the thickness is around a factor of 2x of the iPad. But holding the Toffee Folio case is pleasant, the leather secures a firm grip. Also the 30 pin dock connector, speaker (it's mildly covered but doesn't effect audio output), rear camera, audio jack, volume rockers and mute switch are all freely accessible within the case. However the sleep and wake button is disadvantaged because some of the button is actually covered by the case and that makes it hard to get to. Not really a huge deal as the magnetic sleep and wake system is reliable. To the left hand side of the cases interior are four cut out grooves for holding the iPad upright in four positions. This stand implementation works well and keeps the iPad firmly in place when interacting with the screen. However we originally thought this case had no typing position, as this wasn't stated as a feature on the box. But we actually found that if we folded the case back on its self with the iPad facing upwards, a solid typing position was achieved. Another sort viewing position can be achieved, namely a cars headrest via the elastic band sewed to the rear of the case. Opening and closing this case was initially a slight novelty due to the included magnetic strap but throughout our constant usage for well over a month the magnetic strap has become a hinderance. It does keep the case securely closed and is an ok mechanism for opening it up but when closing the case it doesn't quickly magnetically make contact. We had to align and fiddle with it for a few seconds which doesn't sound awful but the respective nature of this is quickly irritating and unnecessary. Now this cases thick padding and high quality leather will subscribe it to some good protection for the iPad. The leather exterior will likely rip upon dense impact but the padding will offer 360 degree protection. This a great case to keep within a bag and use as a general all round case and have reassurance that the iPad will be safe. All in all we really admire the Toffee Folio iPad case. We think it's one of the better made book styled folio iPad cases. However the few niggles such as the magnetic closing strap and fading leather grants this case with a firm four out of five stars.